Home / -Preview- / Marcia Ball / Preview / Preview: Marcia Ball to Unleash Her Latest Blast of Blues With "Shine Bright"
Preview: Marcia Ball to Unleash Her Latest Blast of Blues With "Shine Bright"
Alligator Records has announced an April 20, 2018 release date for Shine Bright, the new album from Texas-born, Louisiana-raised pianist, songwriter and vocalist Marcia Ball. Born in Orange, Texas in 1949 to a family whose female members all played piano, Ball grew up in the small town of Vinton, Louisiana, right across the border from Texas. Seeing an Irma Thomas performance in 1962 and falling under the spell of Professor Longhair's piano playing convinced Ball to seek out a career in music. She led a couple of early psychedelic country rock bands before perusing her solo career from her adopted hometown of Austin, Texas. Of course, Ball will bring the party on the road, playing her new songs and old favorites for fans around the globe. 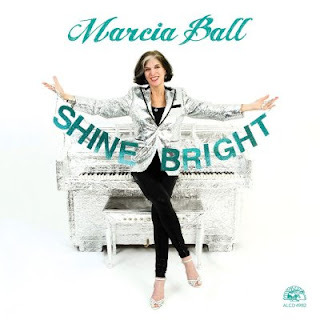 “I still love the feel of the wheels rolling,” she says, “and the energy in a room full of people ready to go wherever it is we take them.” With both her new album and her legendary live performances, Marcia Ball will shine a light into the darkness, making the world a brighter place one song at a time.